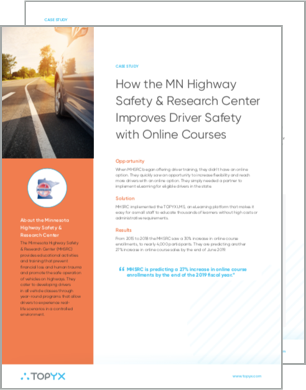 The Minnesota Highway Safety & Research Center (MHSRC) provides educational activities and training that prevent financial loss and human trauma and promote the safe operation of vehicles on highways. MHSRC implemented TOPYX, an eLearning platform, that made it easy for a small staff to educate thousands of learners without high costs or administrative requirements. Discover how MHSRC saw a 30% increase in online course sales. Download the case study.